A place where my fingernails get the spotlight! 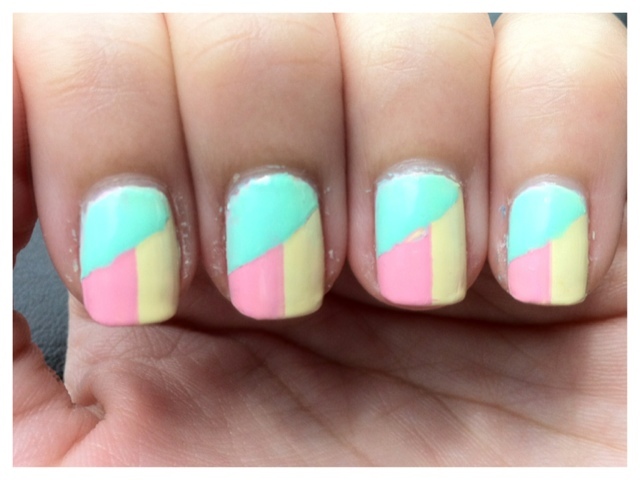 Anyways, since it is both Easter and Spring already I thought I would do some egg-inspired nails today! I really had high hopes for this nail idea but I think I kinda failed on execution. I did a tape manicure and it seems my lines are kinda wonky. It is not bad in this photo but the next photo……please don’t scream. The lines are really quite thick and uneven no matter how my tape is stuck. I suspect I may have pulled the tape off a little too late. Or maybe it’s just the matter of chalky pastel polishes. =/ And surprisingly, of all the nails, the one that turned out the best (in terms of how pretty my lines look) was my pinky. I did a jelly sandwich with OPI Mermaids Tears, Rainbow Honey 20% Cooler and OPI Don’t Touch My Tutu and topped them off with OPI Lucky Lucky Lavender, piCture pOlish peaches n’ cream, mellow yellow, honey dew and Essie Lapis of Luxury. Halloween Mani – Take Two! I felt bad for only having one Halloween-esque mani so I decided to attempt another. My first ever attempt on water marbling!! Is is not perfect but I am sooo happy with it! 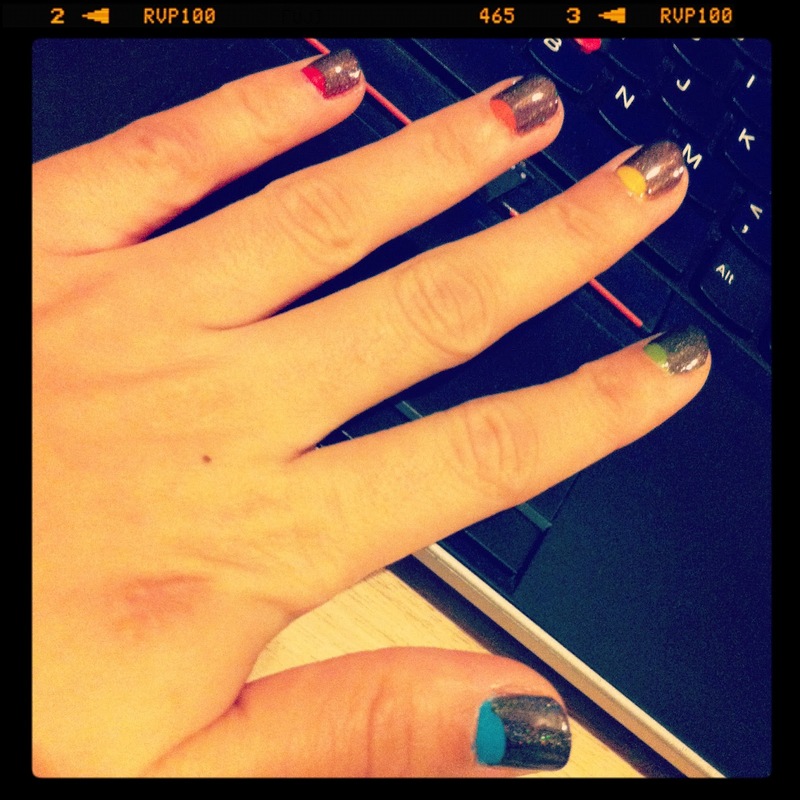 Owh, did you know I actually did this over my last mani. Hehe. Recycling is good for me. You can choose to use tape to tape off your cuticles or if you want to, just apply vaseline on your cuticles to avoid the polish from sticking to your nails. Well, I did it both ways and my final verdict is – go with the tape! If you look closely at the cuticles in the photo above, you can see very clearly that my cuticle area is dryer and the lines at the cuticles are messier for the pointer and middle finger. And for the ring finger, The side of the nails look good but the near the nail bed – not so good. And finally the pinky – good clean lines all over, not too much drying out of the cuticles. Can you guess which is which?? Maybe it’s just me but from now on, if I ever do another water marble I would definitively grab tape to protect my cuticles! Below are a few single finger shots of my middle, ring and little fingers. And of course one of the seldom shown thumb! Anyone else have any good tips and tricks to share for my next attempt? It’s almost Halloween and I realised I haven’t posted a single Halloween related mani. So fail. Let me redeem myself with a Candy Corn mani. Here she is – my one and only Halloween mani this year! I started off with Cult Nails Feel Me Up with OPI Alpine Snow as an accent nail. I them taped off the top and bottom of the nail and painted the centre orange (Sally Hansen Sun Kissed) and then after finished up the tip with more yellow. There is a reason why there is only one candy corn on my finger. I actually intended to do 4 candy corns and a ‘boo’ on my ring finger. But when I googled for candy corn, the centre color was orange. Not yellow. So. Yea. Only one candy corn this year. Hmmm… I wonder how they taste like? 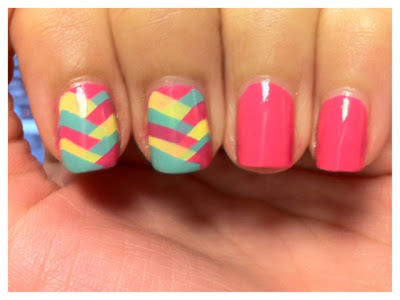 I have seen so many braided manicures out there I was literally itching to try them for myself! Everyone who did it before said it was super easy and, by just looking at their complete manicure, I didn’t believe that it was true. One day while I was reading through my list of blogs that I follow I came across this tutorial by Lucy from Lucy’s Stash and decided to use it as my guide. And guess what! The manicure came out perfect!! And in a short time too!! 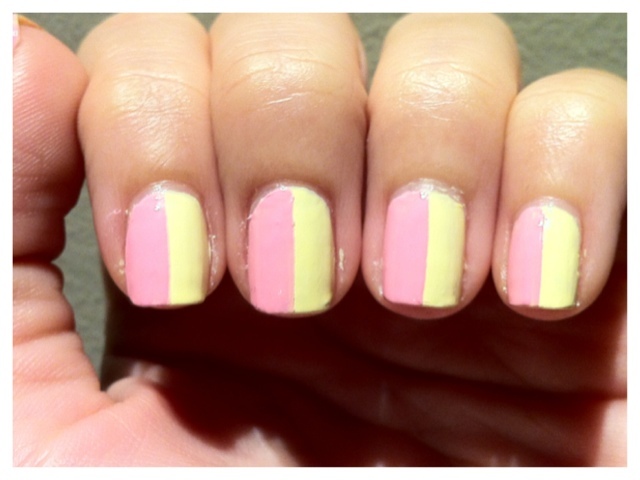 I used all China Glaze colors in this mani: Sugar High (pink), Lemon Fizz (yellow) and For Audrey (blue). And to further convince anyone who is afraid to do this manicure here is a picture of my dominant hand! Aside from the slightly dented ring finger I think this turned out quite good don’t you think? This manicure is ancient. By the look of the messy cuticles and the super nubbins I would say that this manicure is at least 2 years old!! If my memory serves me right, I chose to do this skittle mani because I was down with fever and wanted something to lift my spirits. And it did!! All the colors used in this mani are OPIs: No Room for the Blues, Greenwich Village, Need Sunglases, Flit A Bit and Big Apple Red. Not long after I decided to make my mani less in your face, I went with half moons topped with OPI Private Jet – holo version. I actually got Private jet from a friend as a present. She was gifted it but found that it was not to her taste. Lucky lucky me! This was 2 coats of RH A Little Kindess over 3 coats CG Lemon Fizz. More shots of this lovely polish after the jump! 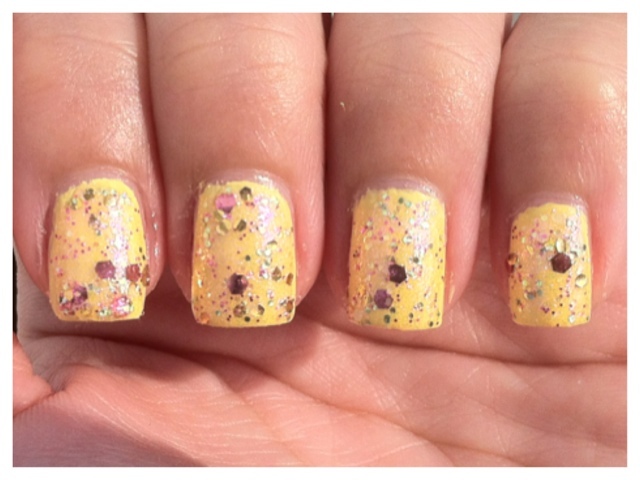 A piCture pOlish trio – Mellow Yellow, Fairy Floss and HoneyDew! 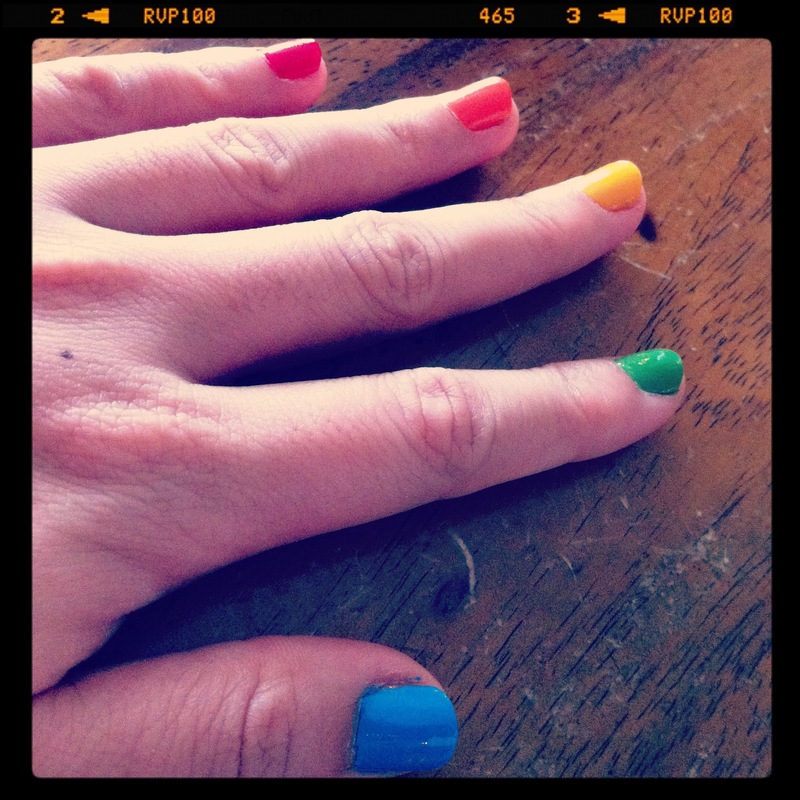 I will be featuring all three of the above mentioned polishes in this post! 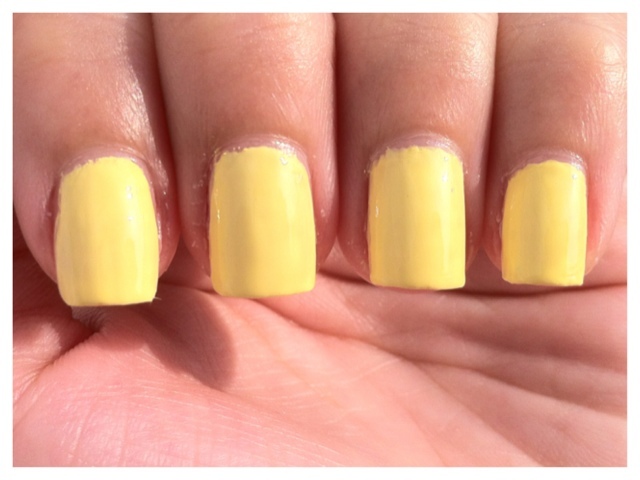 First up is a quick swatch of Mellow Yellow by piCture pOlish before I went to the driving range a few weeks ago. I don’t play golf at all. I just go there with my boyfriend. I’ll be reading while he hit them balls. LOL! I love the color, very Spongbob-y! 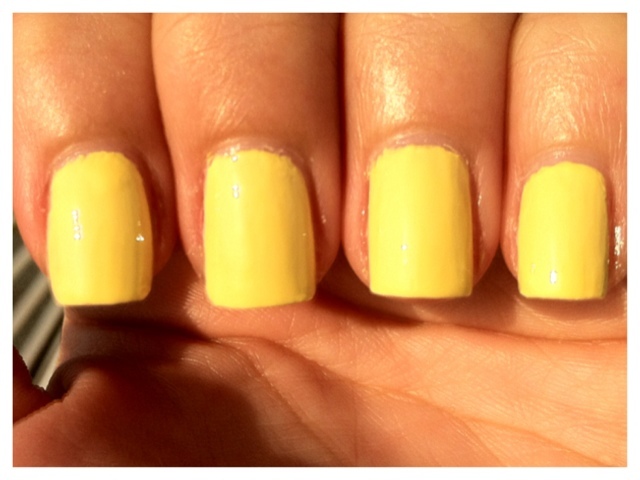 It kinda reminds me of China Glaze Lemon Fizz. Maybe Mellow Yellow is tad lighter than Lemon Fizz. Maybe. 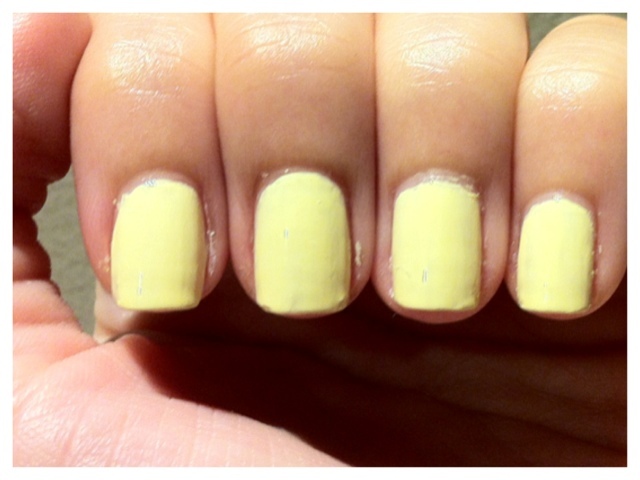 The formula was kinda chalky on the first coat but it evens out as you apply the third coat.. Hmm.. I quickly added a pink half to my nails after I got back from the driving range, topped it off with some SV Quick drying top coat and hopped into bed. And when I woke – NO sheet marks! YAY! The pink I used is from the piCture pOlish soft shades series – Fairy Floss. And to top it all off, I added a dash of HoneyDew on my tips. Well, I did manage to get some photos of this manicure in sunlight while I was out for lunch yesterday. Unfortunately I did not have a chance to apply some cuticle oil before taking these photos. 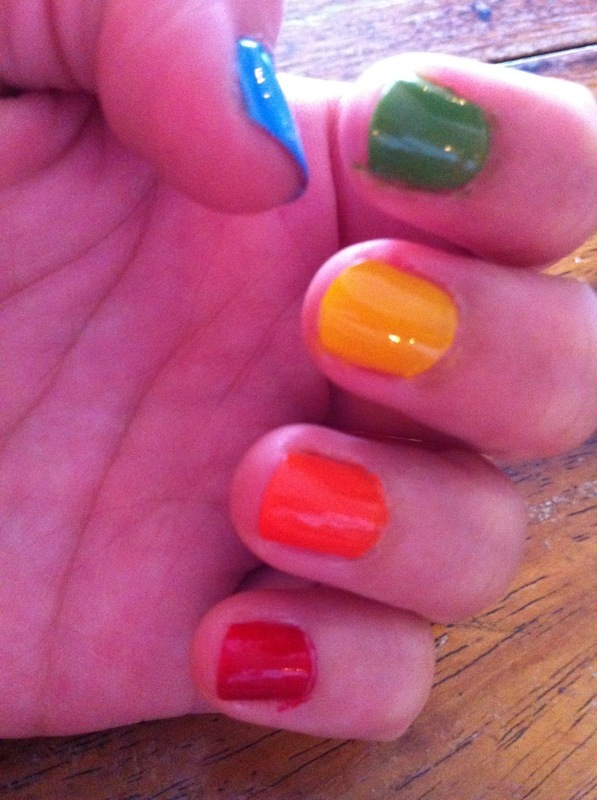 So (again), please ignore the dried out cuticles and enjoy the colors! Wordpress has been giving me a few problems lately - post not saving, reverting to pre-edit stages and all. Hence I will be moving my blog over to blogger instead. I'll be here with more updates :) Thanks for dropping by! [PR] Ready to see the ILNP Fall Collection? Time to join the Cult! 50% off for 200,000 seconds!